MIDWEST LIVING (January, 2017) — Midwest Living has recently selected Diamond Cabinetry's under cabinet Toekick Vacuum as a top kitchen innovation from the 2017 Kitchen & Bath Industry Show and has featured it in a selection of nine innovations that make life easier while also enhancing function in the home. 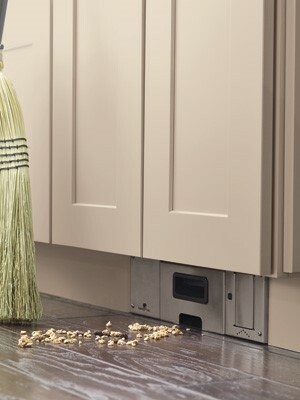 The article reads: "Stop kitchen messes before they collect and eliminate the need for dustpan storage with Diamond Cabinets' new built-in vacuum… Located in the cabinet base, the floor-level vacuum activates with the tap of a foot and features a hidden disposable bag." The Toekick Vacuum Cabinet, featuring a 120-volt strong suction, allows debris to be swept into a hidden disposable bag within seconds, eliminating the need for a dustpan and accelerating everyday cleanups. Midwest Living celebrates life in the Midwest featuring information and inspiration on travel, events, food, dining, recipes, and home and garden.